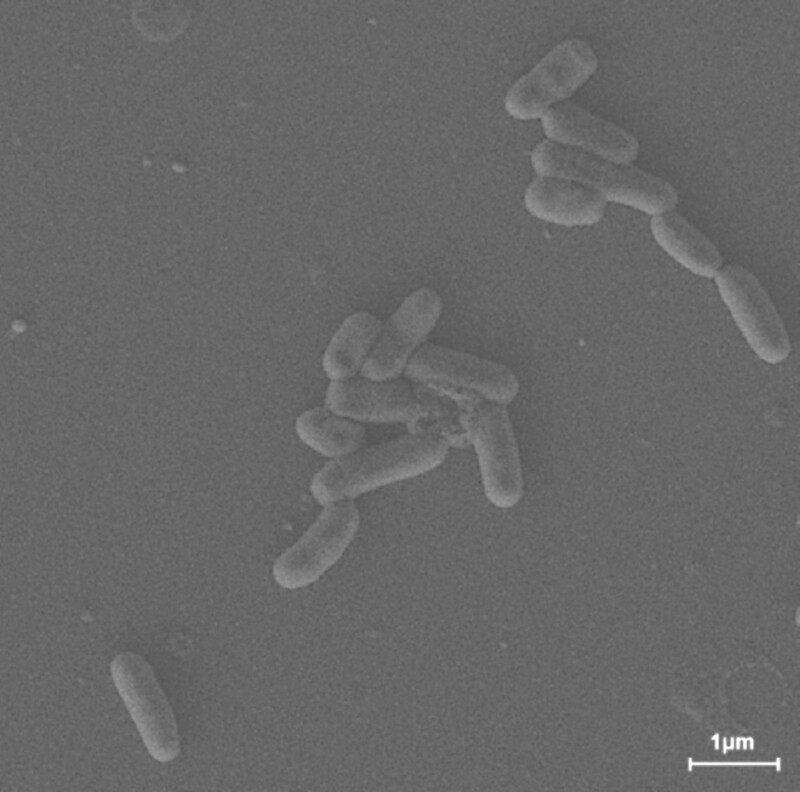 Leucobacter salsicius M1-8T is a member of the Microbacteriaceae family within the class Actinomycetales. This strain is a Gram-positive, rod-shaped bacterium and was previously isolated from a Korean fermented food. Most members of the genus Leucobacter are chromate-resistant and this feature could be exploited in biotechnological applications. However, the genus Leucobacter is poorly characterized at the genome level, despite its potential importance. Thus, the present study determined the features of Leucobacter salsicius M1-8T, as well as its genome sequence and annotation. The genome comprised 3,185,418 bp with a G+C content of 64.5%, which included 2,865 protein-coding genes and 68 RNA genes. This strain possessed two predicted genes associated with chromate resistance, which might facilitate its growth in heavy metal-rich environments. The strain M1-8T (= KACC 21127T = JCM 16362T) is the type strain of the species Leucobacter salsicius , which was isolated from a Korean salt-fermented seafood known as “jeotgal” in Korean. The species epithet was derived from the Latin word salsicius, which means salty . The genus Leucobacter was proposed in 1996  and comprises a group of related Gram-positive, aerobic, non-motile, rod-shaped bacteria. Leucobacter strains have been recovered from a variety of ecological niches, including activated sludge from soil , wastewater [4–6], river sediments containing chromium , nematodes [7,8], food [1,9], potato plant phyllosphere , chironomid egg masses , air , soil , and feces . Several Leucobacter strains have been reported to possess chromate resistance [1,4,11]. At present, there are 18 validly named Leucobacter species, but the only sequenced genomes in this genus were Leucobacter sp. UCD-THU  and L. chromiiresistens . Among them, the highest resistance to chromate (up to 300 mM K2CrO4) was observed in L. chromiiresistens, in vivo . However, no information has been generated on genes related to the mechanism of chromate resistance. L. salsicius strain M1-8T has lower chromate resistance than L. chromiiresistens but it still exhibits moderate resistance (up to 10.0 mM Cr(VI)). Thus, the genomic analysis of L. salsicius M1-8T should help us to understand the molecular basis of adaptation to a chromium-contaminated environment. 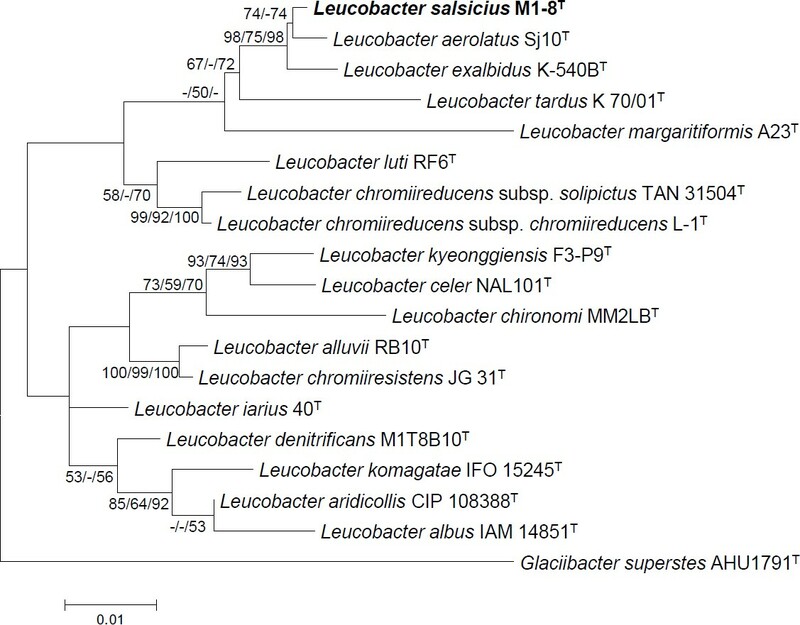 The present study determined the classification and features of Leucobacter salsicius strain M1-8T, as well as its genome sequence and gene annotations. A representative genomic 16S rRNA gene of strain M1-8T was compared with those obtained using NCBI BLAST  with the default settings (only highly similar sequences). The most frequently occurring genera were Leucobacter (65.0%), unidentified bacteria (20.0%), Curtobacterium (6.0%), Microbacterium (5.0%), Leifsonia (2.0%), Subtercola (1.0%), and Zimmermannella (1.0%) (100 hits in total). The species with the Max score was Leucobacter exalbidus (AB514037), which had a shared identity of 99.0%. The multiple sequence alignment program CLUSTALW  was used to align the 16S rRNA gene sequences from M1-8T and related taxa. Phylogenetic trees were constructed based on the aligned gene sequences using the maximum-likelihood, maximum-parsimony, and neighbor-joining methods based on 1,000 randomly selected bootstrap replicates using MEGA version 5 . Strain M1-8T shared 99.1% nucleotide sequence similarity with L. aerolatus Sj10T, the closest validated Leucobacter species according to the phylogeny (Figure 1). Figure 1 shows the phylogenetic position of L. salsicius in the 16S rRNA-based tree. The sequence of the single 16S rRNA gene copy found in the genome did not differ from the previously published 16S rRNA sequence (GQ352403). Phylogenetic tree showing the position of Leucobacter salsicius relative to the type strains of other species within the genus Leucobacter, using Glaciibacter superstes AHU1791T as the outgroup. The sequences were aligned using CLUSTALW  and the phylogenetic tree was inferred from 1,390 aligned characteristics of the 16S rRNA gene sequence using the maximum-likelihood (ML) algorithm  with MEGA5 . The branches are scaled in terms of the expected number of substitutions per site. The numbers adjacent to the branches are the support values based on 1,000 ML bootstrap replicates  (left), 1,000 maximum-parsimony bootstrap replicates  (middle), and 1,000 neighbor-joining bootstrap replicates  (right), for values >50%. Strain M1-8T is classified as class Actinobacteria, order Actinomycetales, family Microbacteriaceae, genus Leucobacter (Table 1) . The strain L. salsicius M1-8T was isolated from a Korean salt-fermented food that contains tiny shrimp (shrimp jeotgal). The cells of strain M1-8T were rod-shaped, 1.0–1.5 µm in length, and 0.4–0.5 µm in diameter (Figure 2). No flagella were observed. The colonies were cream in color and circular with entire margins on marine agar medium. Strain M1-8T was aerobic and Gram-positive (Table 1). Optimum growth was observed at 25–30°C, at pH 7.0–8.0, and in the presence of 0–4% (w/v) NaCl. The tolerance of Cr (VI) was observed at up to 10.0 mM K2CrO4. The physiological characteristics, such as the growth substrates of M1-8T, were described in detail in a previous study . Scanning electron micrograph of Leucobacter salsicius M1-8T, which was obtained using a SUPRA VP55 (Carl Zeiss) at an operating voltage of 15 kV. The scale bar represents 1 µm. The evidence codes are as follows. TAS: traceable author statement (i.e., a direct report exists in the literature). NAS: non-traceable author statement (i.e., not observed directly in a living, isolated sample, but based on a generally accepted property of the species, or anecdotal evidence). These evidence codes are derived from the Gene Ontology project . Figure 2 Scanning electron micrograph of Leucobacter salsicius M1-8T, which was obtained using a SUPRA VP55 (Carl Zeiss) at an operating voltage of 15 kV. The scale bar represents 1 µm. The peptidoglycan hydrolysate from strain M1-8T contained alanine, 2,4-diaminobutyric acid (DAB), γ-aminobutyric acid (GABA), glutamic acid, and glycine. The predominant fatty acids (>10% of the total) in M1-8T were anteiso-C15:0 (63.6%), anteiso-C17:0 (16.7%), and iso-C16:0 (14.2%). The polar lipid profile of strain M1-8T contained diphosphatidylglycerol and an unknown glycolipid. The major menaquinone in M1-8T was MK-11 and the minor menaquinones were MK-10 and MK-7. L. salsicius strain M1-8T was selected for genome sequencing based on its environmental potential and is part of the Next-Generation BioGreen 21 Program (No.PJ008208). The genome sequence was deposited in DDBJ/EMBL/GenBank under accession number AOCN00000000 and the genome project was deposited in the Genomes On Line Database  under Gi21829. The sequencing and annotation were performed by ChunLab Inc., South Korea. A summary of the project information and the associations with “Minimum Information about a Genome Sequence” (MIGS)  are shown in Table 2. L. salsicius strain M1-8T was cultured aerobically in marine agar medium at 30°C. Genomic DNA was extracted using a G-spin DNA extraction kit (iNtRON Biotechnology), according to the standard protocol recommended by the manufacturer. The genome was sequenced using a combination of an Illumina Hiseq system with a 150 base pair (bp) paired-end library, a 454 Genome Sequencer FLX Titanium system (Roche) with an 8 kb paired-end library, and a PacBio RS system (Pacific Biosciences). The Illumina reads were assembled using CLC Genomics Workbench ver. 5.0. The initial assembly was converted for the CLC Genomics Workbench by constructing fake reads from the consensus to collect the read pairs in the Illumina paired-end library. The 454 paired-end reads were assembled with Illumina data using gsAssembler ver. 2.6 (Roche) and the PacBio sequences were clustered into overlapping assembled data. CodonCode Aligner and CLC Genomics Workbench 5.0 were used for sequence assembly and quality assessment in the subsequent finishing process. The Illumina (189.78-fold coverage; 4,003,590 reads), PacBio (88-fold coverage; 23,441 reads), and 454 sequencing (7.96-fold coverage; 130,181 reads) platforms provided 213.62 × coverage (total 4,157,212 sequencing reads) of the genome. The final assembly identified one scaffold that included 28 contigs. The genes in the assembled genome were predicted using Integrated Microbial Genomes - Expert Review (IMG-ER) platform as part of the DOE-JGI genome annotation pipeline , followed by a round of manual curation using the JGI GenePRIMP pipeline. Comparisons of the predicted ORFs using the SEED , NCBI COG , Ez-Taxon-e , and Pfam  databases were conducted during gene annotation. Additional gene prediction analyses and functional annotation were performed with the Rapid Annotation using Subsystem Technology (RAST) server databases  and the gene-caller GLIMMER 3.02. RNAmer 1.2  and tRNAscan-SE 1.23  were used to identify rRNA genes and tRNA genes, respectively. The CLgenomicsTM 1.06 (ChunLab) was used to visualize the genomic features. The genome comprised a circular chromosome with a length of 3,185,418 bp and a G+C content of 64.5% (Figure 3 and Table 3). Of the 2,933 predicted genes, 2,865 were protein-coding genes and 68 were RNA genes (three 5S rRNA genes, three 16S rRNA genes, three 23S rRNA genes, 51 predicted tRNA genes, and eight miscRNA genes). The majority of the protein-coding genes (2,275 genes; 77.6%) was assigned putative functions, while the remainder was annotated as hypothetical proteins (182 genes). The genome properties and statistics are summarized in Table 3. The distributions of genes among the COGs functional categories are shown in Table 4. Graphical map of the largest scaffold. From the outside to the center: genes on the reverse strand (colored according to the COGs categories), genes on the forward strand (colored according to the COGs categories), and RNA genes (tRNAs in red and rRNAs in blue). The inner circle shows the GC skew, where yellow indicates positive values and blue indicates negative values. The GC ratio is shown in red/green, which indicates positive/negative, respectively. aThe totals are based on either the size of the genome in base pairs or the total number of protein-coding genes in the annotated genome. aThe total is based on the total number of protein-coding genes in the annotated genome. Leucobacter salsicius M1-8T and Leucobacter members, such as L. chromiireducens, L. aridicollis, L. luti, and L. alluvii, have been shown to possess chromate resistance in previous studies, while Zhu et al. reported the reduction of chromate by Leucobacter sp. . In the present study, the genome analysis of Leucobacter salsicius M1-8T detected two copies of chromate transport protein A (ChrA), which is a membrane protein that confers heavy metal tolerance via chromate ion efflux from the cytoplasm. Potentially, this gene is a key feature that allows Leucobacter to adapt to chromate-contaminated environments. 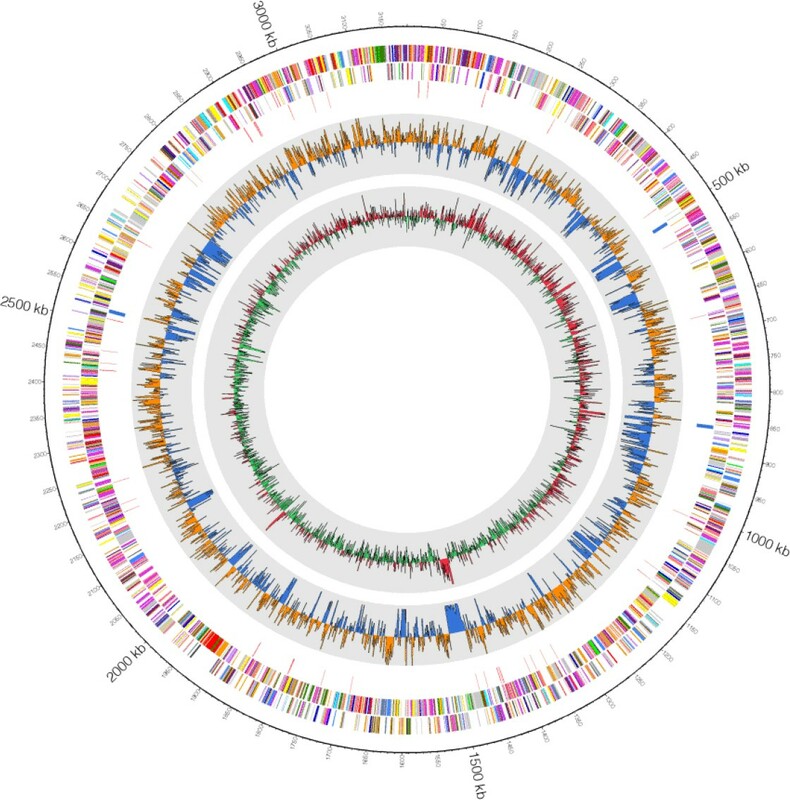 The genome sequence of L. salsicius M1-8T should provide deeper insights into the molecular mechanisms that underlie chromium tolerance and it may facilitate the development of biotechnological applications to improve chromium-contaminated field sites. We would like to thank Seong Woon Roh and his team members for help with SEM analysis (Jeju Center, Korea Basic Science Institute, Korea). This study was supported by a grant from the Next-Generation BioGreen 21 Program under No. PJ008208, Rural Development Administration, Republic of Korea.